UCI Law Stories: Past, Present, and Future is a UCI Libraries and UCI Law collaboration to celebrate the ten-year anniversary of the law school – highlighting its revolutionary past and brilliant future. The exhibit includes select writings and memorabilia showcasing UCI Law’s historical beginnings, the school's founding vision, and its pioneering and entrepreneurial community partners, faculty, staff, students, and alumni. 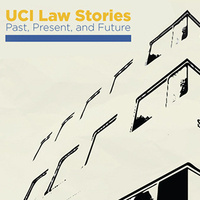 An extensive video archive produced by UCI Law accompanies the exhibit, complete with approximately 50 interviews from UCI Law leaders and friends. Finally, select pieces from UCI Libraries' newest collection, the Founding Dean Erwin Chemerinsky Papers, will be presented in the exhibit. The program will be followed by a reception and exhibit viewing in Muriel Ansley Reynolds Gallery, Langson Library, UCI. The event is free and open to the public; reservations are first come, first served. For further information please call 949.824.4651 or email partners@uci.edu. UCI Law Stories is curated by Christina Tsou, Research Law Librarian for Faculty Services; Jessica Pierucci (Law ’13), Research Law Librarian for Foreign, Comparative, and International Law; and Brian Richard Williams, Research Librarian for Criminology, Law & Society, U.S. & California Government Information and Education and Outreach; and is designed by Jennifer Betonio, Allan Helmick and Sylvia Irving. The UCI Law video archive is produced by Ryne Hodkowski, Public Relations Manager, UCI Law; Anna Iliff, Digital Content Specialist, UCI Law; and Colleen Taricani, Assistant Dean for Communications, UCI Law. To view UCI Law's anniversary webpage, please follow this link - law.uci.edu/10th.